F-150s were assembled in Australia from a variety of American and home-grown components. This resulted in a subtly strange look to the trucks if you are used to seeing the American market version on a daily basis. Now sold only as imported vehicles, the F-100 and F-150 trucks were once pieced together in Australia for those who desired something slightly more substantial that the Falcon Ute. The steering column and left-hand shift were stolen from the Aussie Falcon. The gauge cluster was American, but about 10 years old. The sealed beam headlights that left the US in the mid-80's stayed with the Australian F-150 for close to a decade. 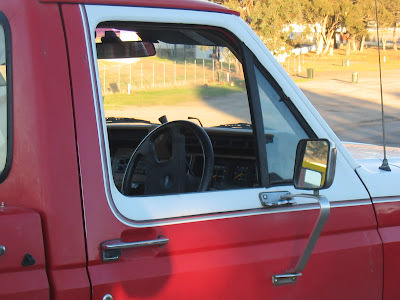 The unique dash and front bench seat were even Australian Falcon derived. 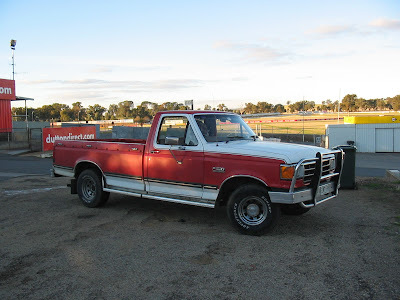 This particular truck spotted at Winton Raceway in Winton, Victoria belongs to a corner worker at the track and is kept in impeccable condition.